Present were Glen Lea, Ron Williams, Bob Erickson, Don Cull, Ron Crane, Bill Flora, Grant Saviers and Ed Thelen. Soon Jeff Stutzman joined us. Jeff knows Ron Crane and was curious about our efforts. There were lots of folks, and we also had a big day :-)) Where to start? We took a trip to deep storage with Chris Garcia to examine a newly donated IBM 085 collator, and put on the skins as requested by Allison Akbay, CHM Registrar. First, apologies, Bill Flora & Don Cull worked on the punch of the 1402 ReaderPunch - and I have no idea what they did - they were using the 1401 to send commands to the punch. 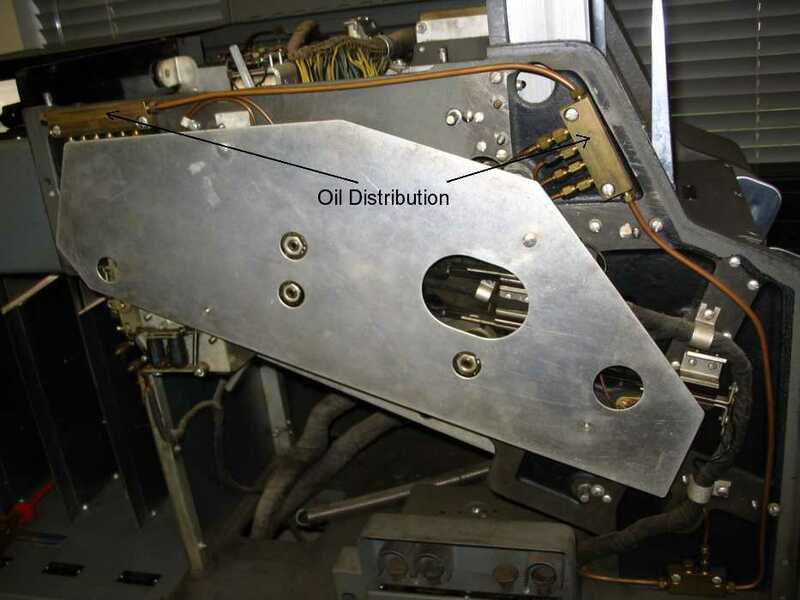 Bob Erickson Glen Lea are disassembling the 077 collator to further examine the high friction problem. (The 1/4 horse motor could not bring the machine up to full speed as reported last week.) Later they were joined by a photographer from the Palo Alto Times doing an article on Len Shustek and Donna Dubinsky - members of the CHM Board of Trustees. Grant Saviers brought in an ultrasonic cleaning machine to aid in cleaning many items. Here he is cleaning a shaft from the 077 collator above. The blue thing is a tooth brush - handy!! The 077 collator has lots of shafts to help guide and propel cards along the card path. 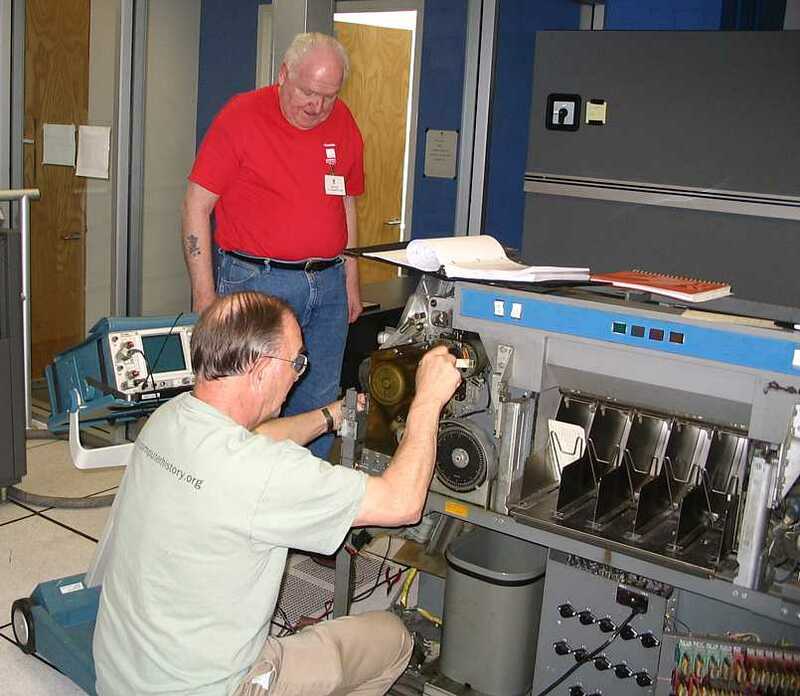 Ron Williams, Ed Thelen & Jeff Stutzman worked on making replacement Strip Residuals from 2 mil magnetic tape instead of 3 mil mylar which we could not find yet. 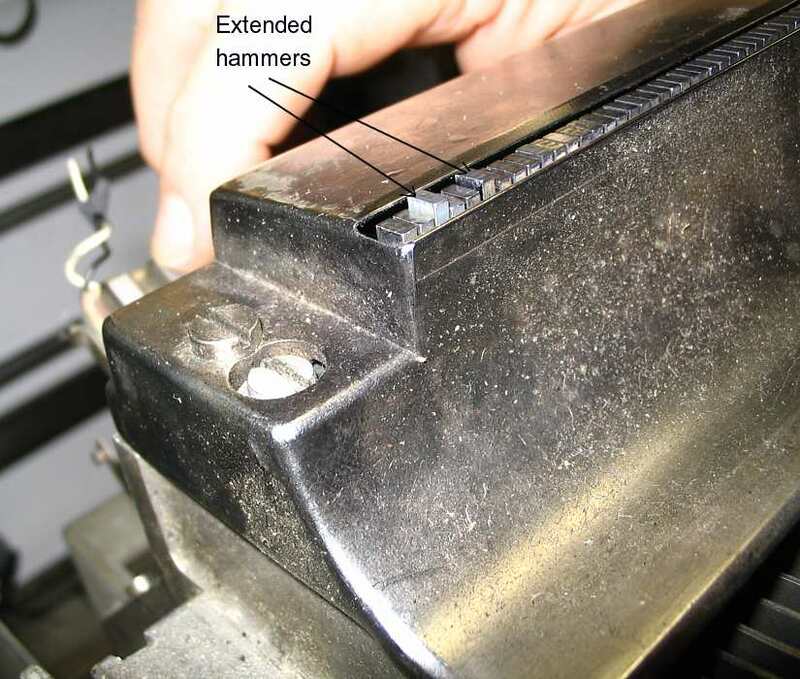 The Strip Residuals (name from 1403 Maintenance Book) prevents Hammer Armature from contacting rest of electromagnet and possibly sticking from residual magnetism. The guy on the ladder is Dave Dial, new Vice President of Operations -this is my best picture as he was either on the roof checking odd situations or had head in overhead. Sit down and hang onto your hat. After you had gone we removed the first feed roll from the primary feed and the needle bearings on it are worn the same way, maybe a little worse. 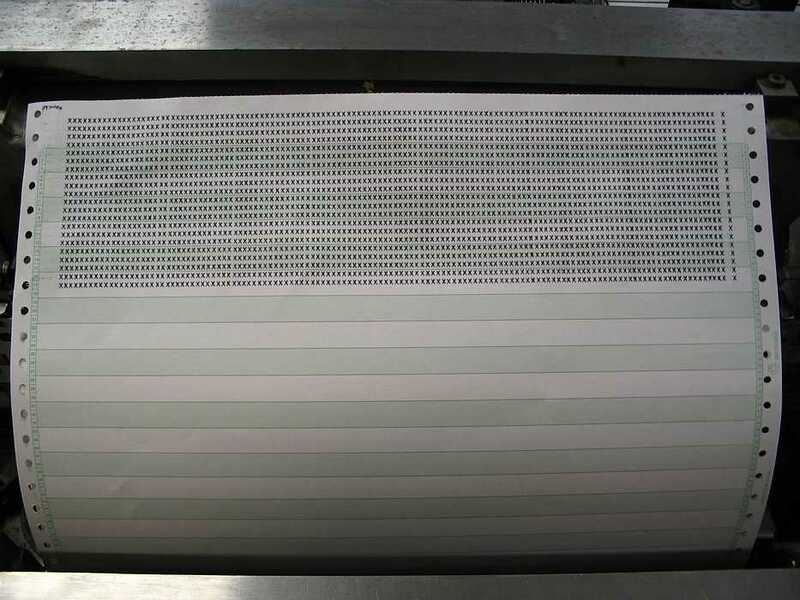 So maybe we should think about taking our replacement parts from one of the two other machines that we have, There is an 077 in visual storage and an 085 that just came in, I believe all the first feedrolls are the same, so hold off on making repairs to the roll you have until after next wednesday. 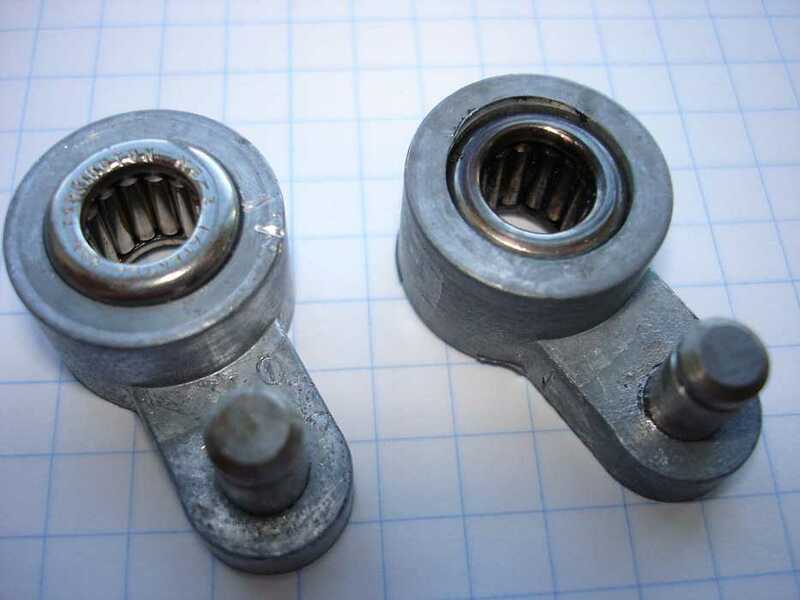 Ok, although I've ordered the bearing stock ($9). Fixing several of these, once the design and process is thought through and fixturing built is pretty easy. I measured the feed roll I have and produced a drawing, attached in pdf form. 11 KiloBytes I'm learning a new CAD package so niceties like hidden lines aren't yet in my skill set. You can quickly check the other shafts with the dial caliper is the 1401 room to see if they are the same. 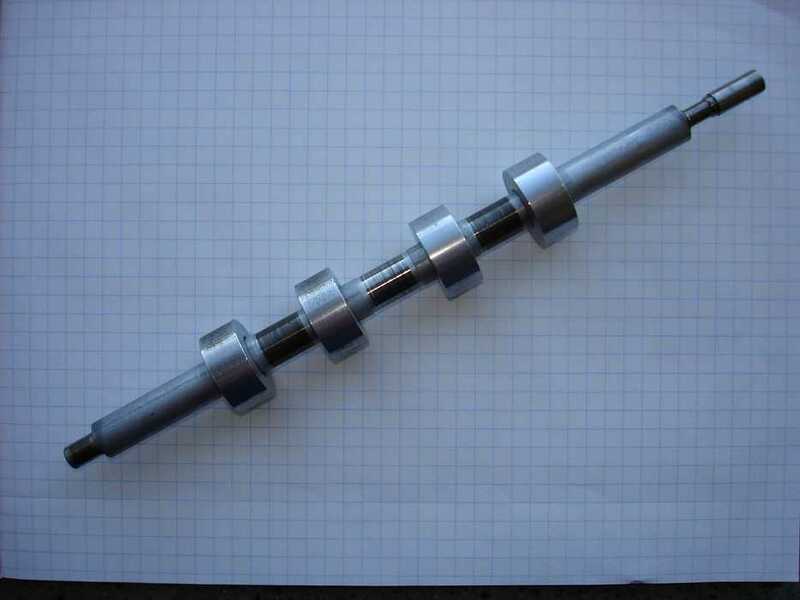 shaft: This is the main feed shaft from the 077 collator, after ultrasonic cleaning. 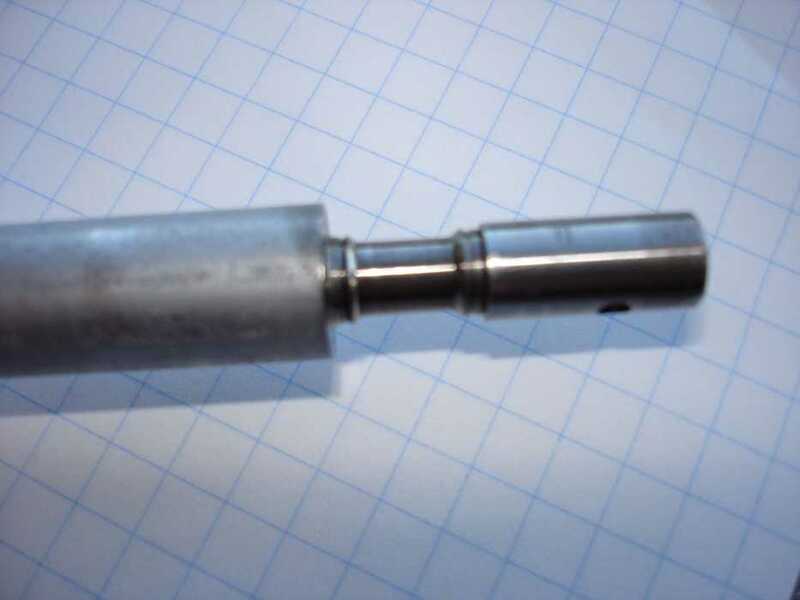 The drive gear attaches to the right end with a taper pin. The center bearing surfaces run in oilite journals and although lightly scored are within 0.002" of their 0.500" size as manufactured. The card rollers are round and have virtually no wear. good journal: This end runs in a needle bearing, Torrington NB3, and probably is case hardened to HRC58 or so. 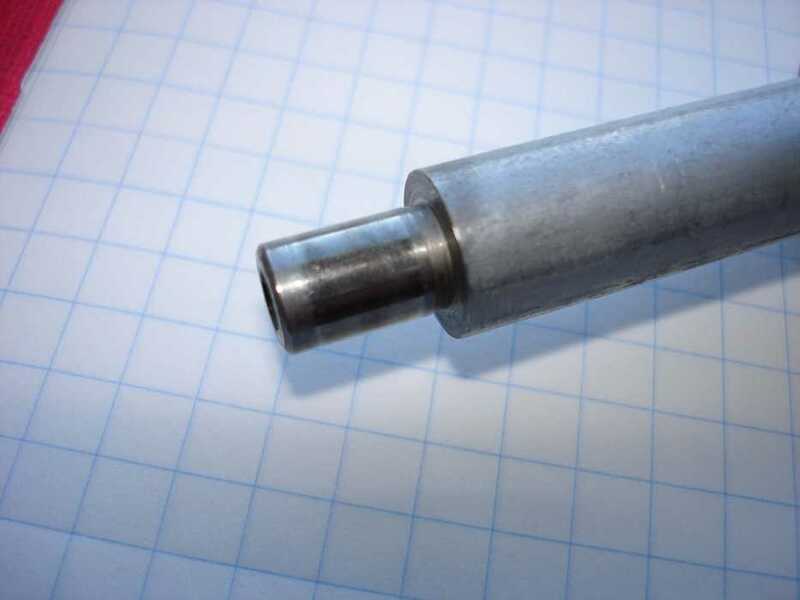 needle bearings: the left bearing barely turns and luckily didn't damage the shaft. The right bearing is frozen. It got so hot that the bearing steel is a blue-brown color, indicative of temperatures in excess of 400 deg F.
Present were Bob Erickson, Jeff Stutzman, Chuck Kantman, Ron Williams, Bill Flora, Allen Palmer, Frank King, Bob Feretich, Robert Garner, Ron Crane and Ed Thelen. Lots of action. The printer seemed somewhat out of alignment. (Shipping, aging, and new gaps due to new "Strip Residuals" will do that. This is somewhat improved. Column 131 seemed erratic - what is going on??? And this is how you adjust the horizontal position of individual characters. First and foremost, the hammer must strike the character slug at the right time so that all of the character is hit by the hammer. "H" is a good test character as it has both sided to be printed. Next, you should fine adjust so that the characters seem evenly spaced. The wood handled tool has an eccentric cylinder on the tip, to move something inside the individual hammer assembly. The long handled screwdriver releases and tightens the clamping mechanism to keep the adjustment fixed. After a long period of adjustments, and frustration with column 131 - there was the unmistakable aroma of overheated insulation. 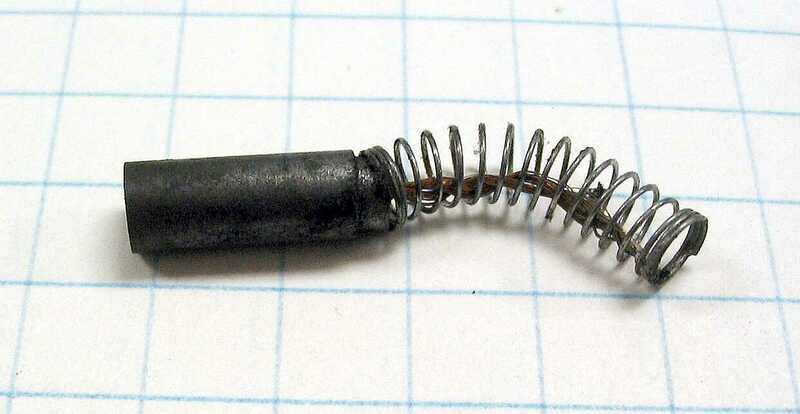 The solenoid coil of hammer 131 was blackening!! The resistance of coil 131 was found to be 2 ohms rather than the nominal 8 ohms!!! OOPS - an internal short between 2 windings? 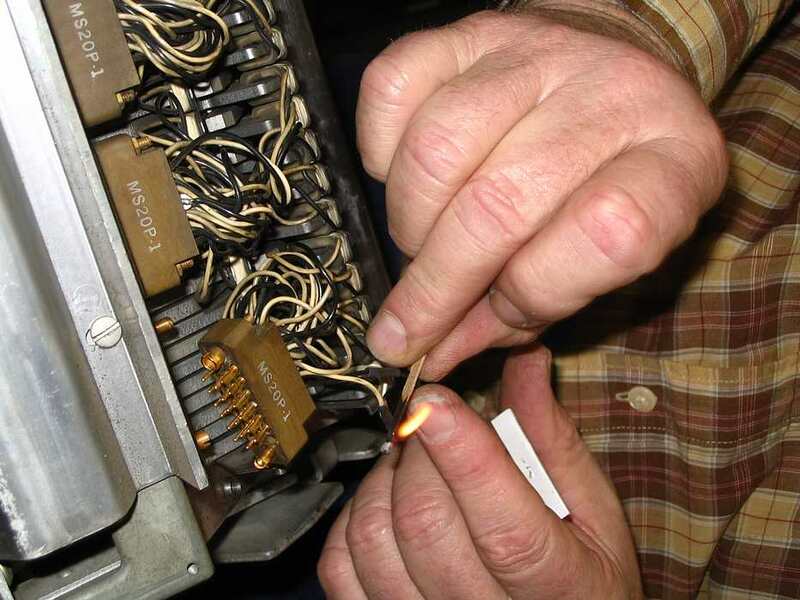 Here Ron Crane is trying to remove the 85 mil connector pins (so we can replace with a spare coil) and we don't have the proper (standard) tool - well, maybe next time. - with maybe 63 overlays or phases and a paper describing the "phases"
of course you could compile and execute more on a larger machine. 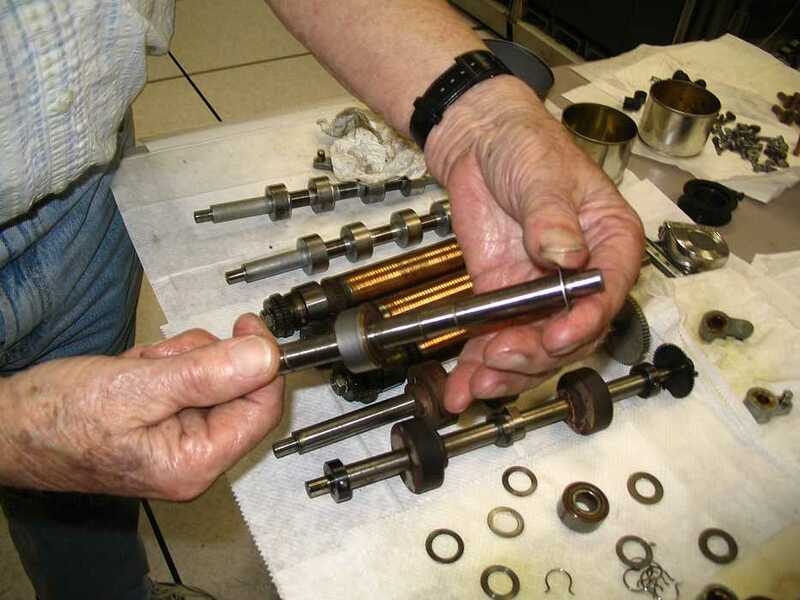 And the sick bearing and shafts of the 077 collator. Dag Spicer gave us permission to examine the 077 in Visible Storage. OK - so this is a newer generation machine. The needle bearings have been replaced with sintered bronze bearings, and a lubrication system installed to assure long life. 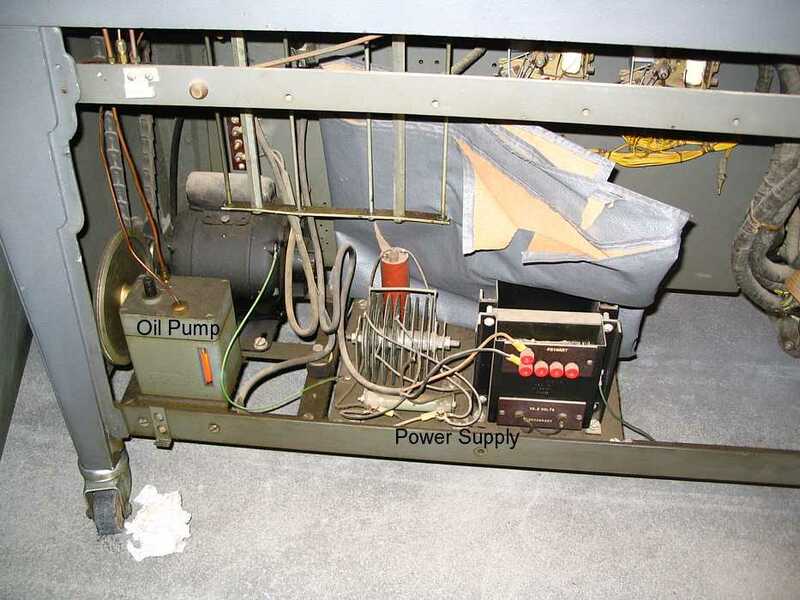 Here is the oil pump and an authentic power supply. The power supply in "our" 077 is definitely an emergency substitution of a power supply designed for another use. Present were Bob Erickson, Ron Williams, Tim Coslet and Ed Thelen. Ron wants to point out that the hammers do not travel much - not at all like a typewriter key. Ron is pushing 2 of the hammer solenoids. Ron is soldering the wires for the replacement coil. The coil had pins for the plug, but we could not remove the old pins - so cut off the new pins and soldered. 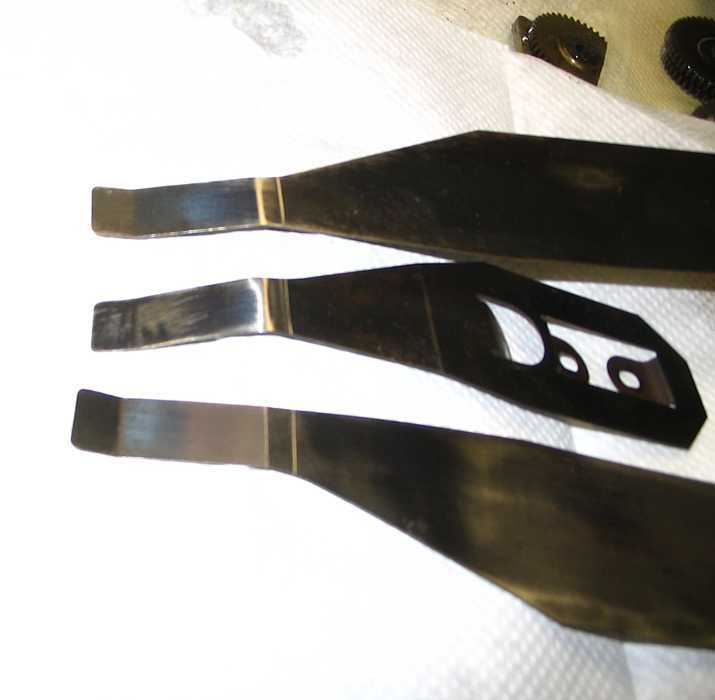 The heat shrink provides electrical insulation and physical protection and stiffness to the soldered joint. And this is how you can apply heat to the heat shrink - yes, that is a match :-| In electrical shops, there is a heat gun (like a hair blower) to do the job. Bob Erickson continued working on 077 collator. cleaning shafts, bearing, ... with ultrasonic cleaner. 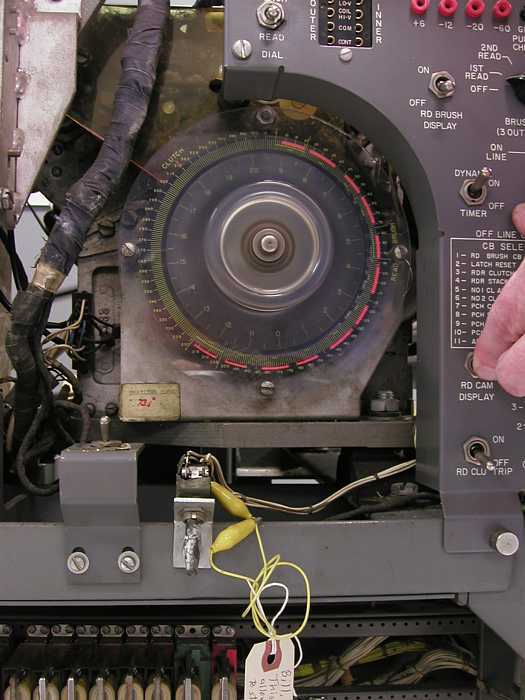 We noticed that the magnetic tape emergency "Strip Residuals" (- see Jan 11th ) had apparently charred in the magnetic gaps of the print hammer solenoids. Weird!! The coils and iron shouldn't get that hot under the low duty cycling last Wednesday. 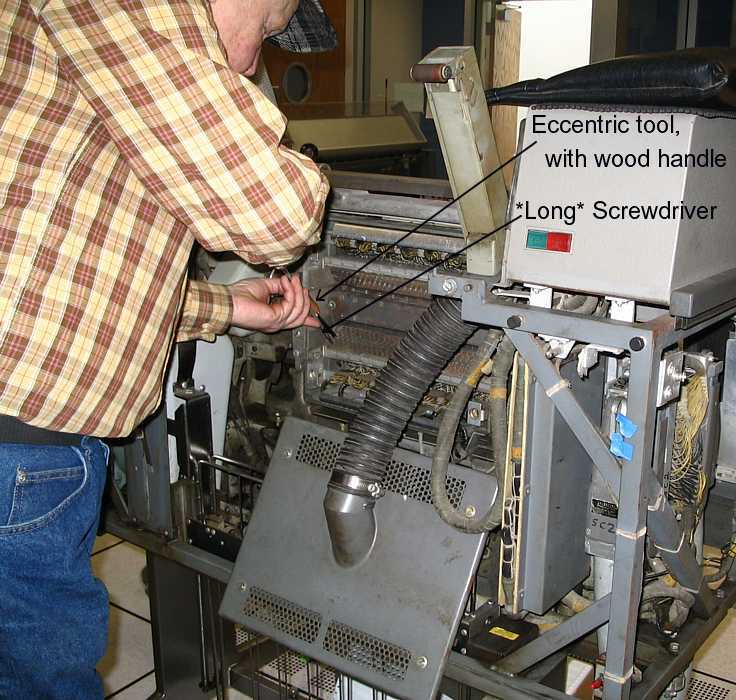 Ed Thelen and Ron Williams cut some of Frank King's "Cutone" 3 mil plastic into 1/2 inch strips using the half inch grid of a paper cutter base to replace the mag tape "Strip Residuals" . Ed Thelen then glued the strips into the 1403 as a temporary measure to see what happens. Will there be blackening and or wear? 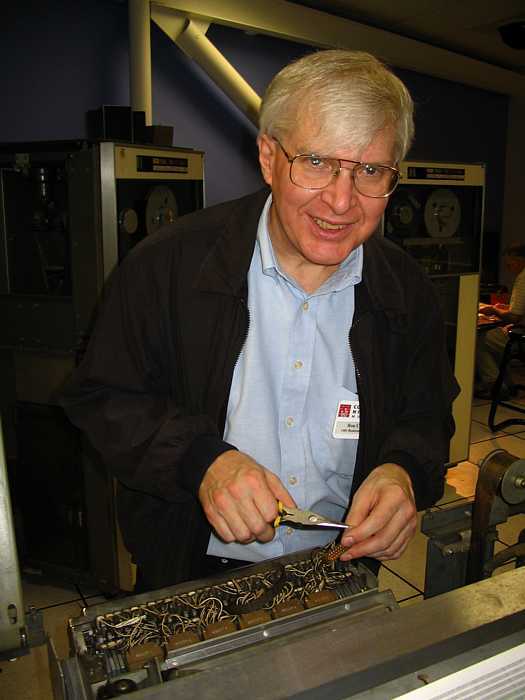 - Bob Feretich is confident that the 1402 controller, which he and Ron Williams debugged in this bring up - does not have the Binary Read optinal feature. "I saw nothing in the logic diagrams that indicated it had the feature. If it does, then the column binary feature must be almost completely independent of the main reader logic." Dear Folks - the 1403 printer appears functional !! Frank King wants to make sure that we don't run any "break the chain" programs. He said that some folks wrote print routines that were intended to maximally stress the "chain". The "links" of the print chain are held together with a plastic band (that seems to have glass fibers? length wise in it?). Other plastic in the printer - such as the "Strip Residuals" - have not done well over the last 45 years, and Frank does not want to break this plastic band either. 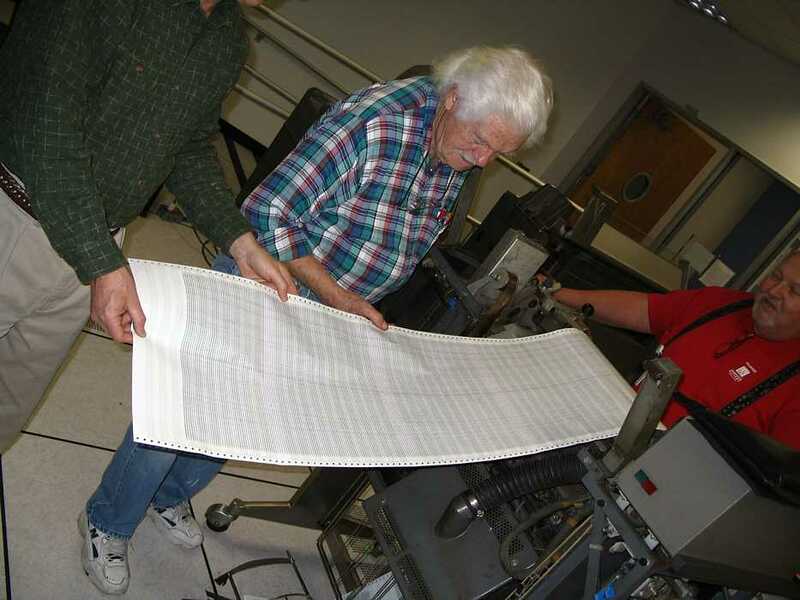 Frank wishes to point out that playing "music" programs on the 1403 printer was a very infrequent event in the old days - and he wishes to keep it infrequent! Many people pitched in to help with many things - name assignments do not mean that others did not help - "Many hands make light work." And indeed "work" seemed very easy today. Sad to say, the world doesn't go that easily - operating the TAU switches yields no actions at the 729 tape unit :-(( bummer !! Left image - this is the box which will contain the TAU Checker - the design is complete - but now the wire wrap and debug begins. 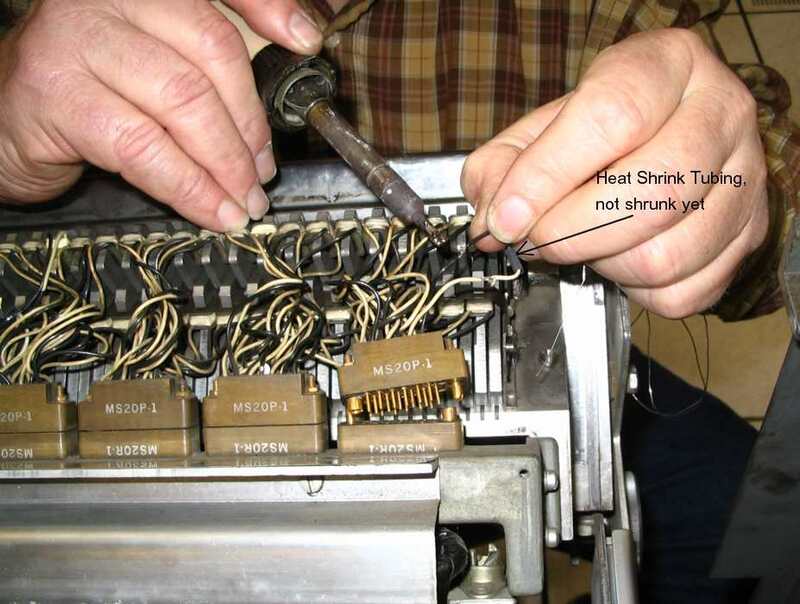 Bill Flora, Robert Garner and others worked on the 1402 Reader Side - replacing the dynamic timing unit which has long been a thorn. Repeated attempts to get it to work well have failed - They removed the dynamic timing unit from the 1402 in Visible Storage and installed it in this machine. Bob Erickson and I (Ed Thelen) (with Dag's permission) moved the 077 collator from Visible Storage into the 1401 Restoration to better swap some badly damaged feed rollers. This work is proceeding quickly so that there will soon be a 077 collator back in visible storage. The unit from Visible Storage has the original power supply - with selenium rectifier yet :-| Bob says it is not illegal to power selenium rectifiers due to potential dangerous outgassing if the unit is overdriven (shorted). 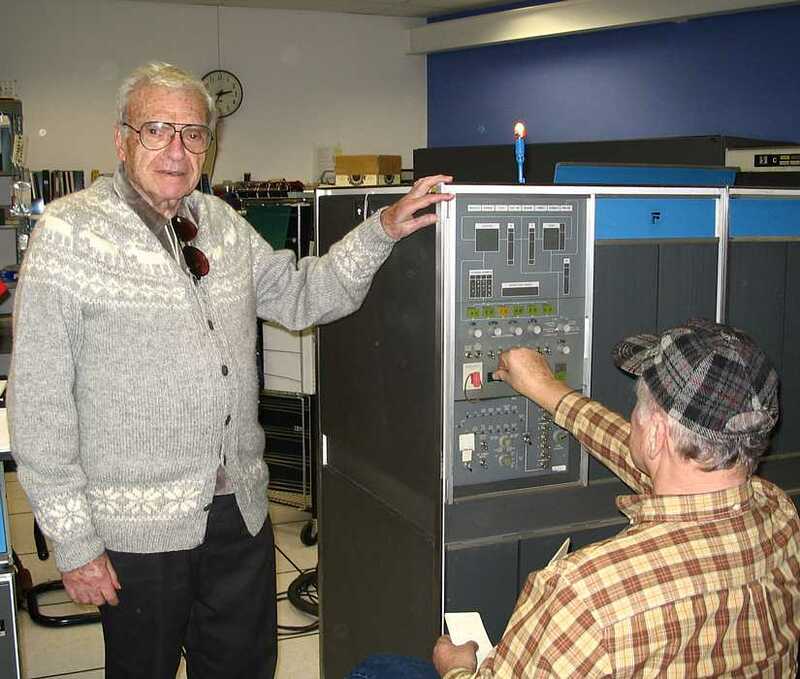 Bill Selmeier took a movie of the action "... IBM 1401 they have been restoring to print. Posted on his web page. Present were Ron Williams, Bill Flora, Bob Erickson, Tim Coslet, Robert Garner and Ed Thelen. Bill Flora fixed the 1402 read dynamic indicator which has been plauging us for months. Look at it positively glowing. :-))) He did this by exchanging the neon bulbs and hold down (?) from the one in visible storage. This is one of the brushes examined on this pass of fixing the 1402 card reader dynamic timing indicator. But, of course, since we're still getting read checks and spuriously reading incorrectly, there's still something wrong with the 1402 interface, which Ron and Bill worked on most of the afternoon. Ron Williams made a program to make successive powers of 2 by repeated addition. 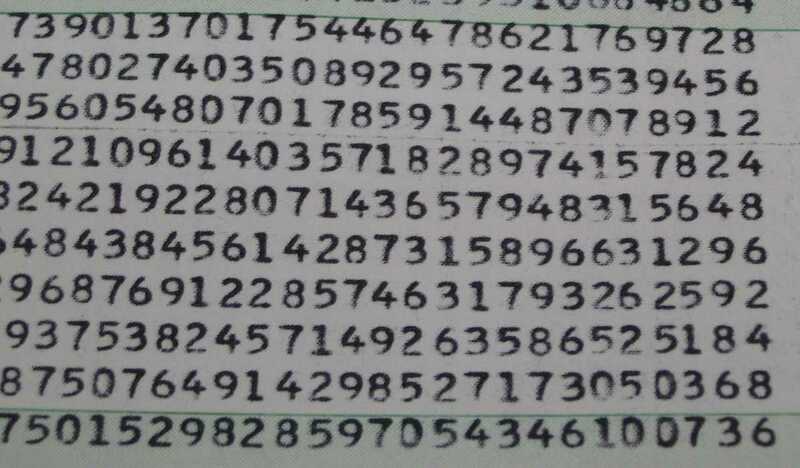 This is the numeric print font of the 1403 chain in the machine now. The printer ribbon is new and still smearing a bit. 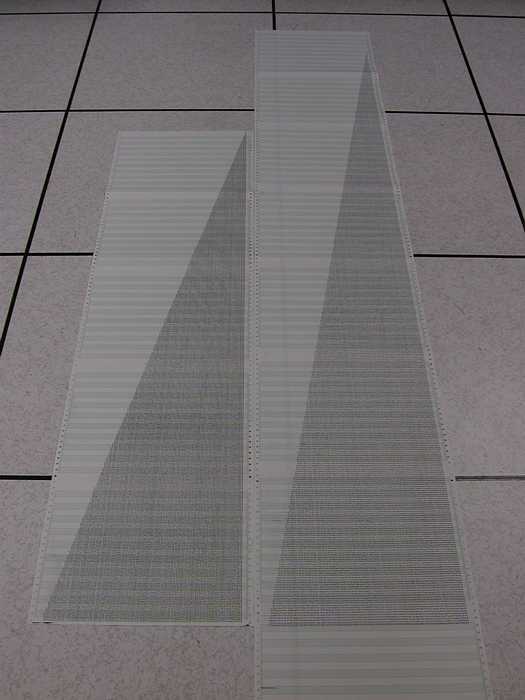 These are 077 card deflectors to get the cards into the selected pocket. Can you imagine the number of cards passed through to get this kind of wear? This is just a note - they still have more service life left than we are likely to give them. 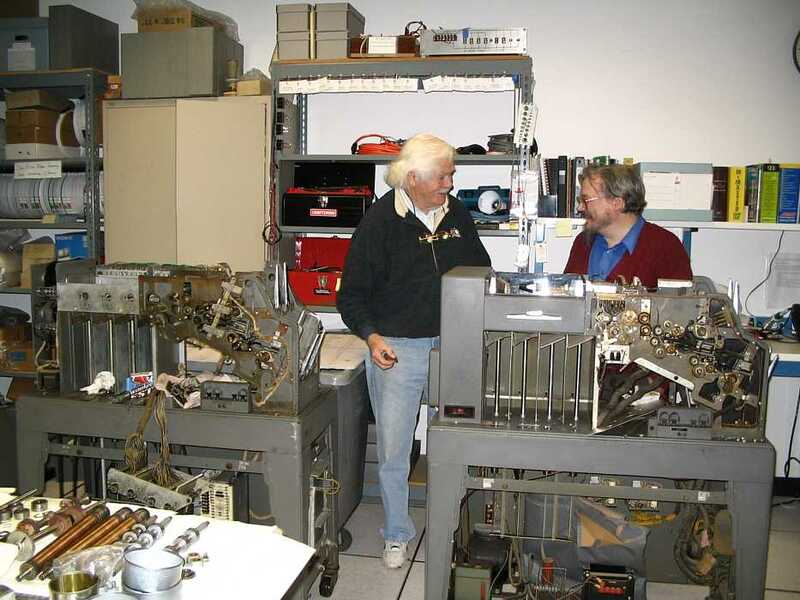 Bob Erickson and Tim Coslet enjoying near the Visible Storage 077 Collator.